Noted bus industry identity George Sampson died earlier this week aged 80 after battling cancer. Transit Systems Director Lance Francis says Sampson was well known and respected by many bus owners throughout Australia, and many in the bus industry will mourn his passing. "He was among the first if not the first to order a touring coach with air-conditioning," Francis says. Ever the innovator, Sampson is also credited with being among the first to fit on-board toilets on his coaches, and in later years installed bin alarms so that bin doors couldn’t be inadvertently left open. The centre of Sampson’s operations was based at Shoalhaven on the NSW south coast near his property at Huskisson. 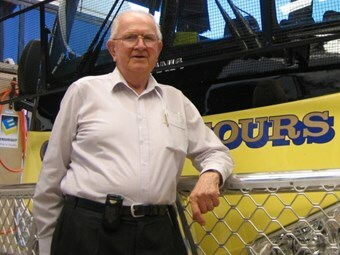 His bus operation enterprises spread to the Whitsundays in Queensland, and more recently to Kalgoorlie where he owned and operated Gold Rush Tours. Sampson was also a director of Swan Transit in Perth. Francis says Sampson was still active at Gold Rush Tours prior to his illness and travelled regularly to Kalgoorlie, and kept in daily contact with the WA operation’s management. His financial interests also extended to owning industrial property in Nowra, Kalgoorlie and Sydney. Sampson is survived by his wife Faye. George Sampson’s funeral will be held at 2pm Friday August 5 at the Shoalhaven Memorial Gardens and Lawn Cemetery, Worrigee Road, Worrigee, east of Nowra.